What is it about carrot cake? I don’t know anyone who doesn’t like carrot cake. Do you? The way I make carrot cake, there are plenty of shredded carrots—but even if you don’t like carrots (like my oldest, who hates all vegetables equally, poor kid), you must like carrot cake. There’s something about the marriage of cream cheese with carrots that don’t really even taste like carrots-for-salad with cinnamon and, for me, a hint of freshly grated nutmeg. This recipe really does round out my carrot cake repertoire. I have the classic gluten free carrot cake recipe all wrapped up, plus the Entenmann’s-style carrot cake with crushed pineapple in the batter, too. I went a little bit light on the confectioners’ sugar in the cream cheese filling. If you add more confectioners’ sugar, you will get a more stable filling. But it will threaten to overwhelm the other flavors in these gluten free carrot cake pies with an overwhelming rush of pure sweetness. As it is, these pies do best when they are chilled until the filling is firm. I’ve read all sorts of explanations for the moniker “whoopie pies,” but the one that sticks out for me is that children would see them in their lunchboxes and call out “WHOOPIE!” That has to be the sorriest excuse for a silly naming story I’ve ever heard in my entire life. I tend to like cupcakes more than cake, but that might be because a cake just doesn’t make for very convenient leftovers. The shredded carrots here tend to rob these cakes of the perfect dome shape of a more classic whoopie pie. But they’re still light, fluffy and tender as can be. I use a pastry bag fitted with a large plain piping tip for everything from the pies themselves to piping in the filling. But you can easily get away with just spooning both the batter for the cakes and the filling between them. Watch this short (1:19) how-to video. Push play ▶ below to watch me make these sweet little cakes, and then make your own! Dairy-free: I’m happy to report that I’ve successfully made the whoopie pies plus the cream cheese filling dairy-free. 🎉 For the cakes, the only dairy-containing ingredient is the melted and cooled butter, and potentially the milk. For the butter, I feel pretty confident that you can use any vegan butter replacement. I’ve used both Earth Balance buttery sticks and Melt brand vegan butter sticks (which I love love love). For the milk, any unsweetened milk replacement that isn’t fat-free and isn’t, say, a super high-fat can of coconut milk, will work just fine. My favorite is unsweetened almond milk. Shortening: If you see shortening as an ingredient in a recipe and want to turn the virtual page, please hear me out! Shortening, unlike butter or vegan butter replacements, is solid at room temperature but has little to no moisture (unlike butter, vegan or otherwise). It helps baked goods stay put and not spread too much in the oven, and frosting to hold its shape. I don’t buy or use Crisco. I recommend Spectrum nonhydrogenated vegetable shortening, which is much heathlier for you and sustainably sourced. To replace shortening, you can try using virgin coconut oil (the triple filtered kind has no coconut aroma), but it won’t always work exactly the same. Egg: Since there is only one egg in this recipe, I think a “chia egg” (1 tablespoon of ground chia seeds + 1 tablespoon of lukewarm water, mixed and allowed to gel), but if you’re feeling adventuresome and want to try a boiled flax egg like we did in our vegan black bean brownies, that would work great. Sugar: You cannot replace the brown and confectioners’ sugars in this recipe with a liquid sweetener of any kind. You should be able to replace the brown sugar with coconut palm sugar, but I’d recommend grinding it further so it dissolves properly during baking. For an entirely sugar-free recipe, you can try replacing the brown sugar with Swerve brown sugar replacement or even Lankato brand (I’ve just started experimenting with that; nothing to report just yet! ), but those sugar replacements tend to absorb more moisture so you might have to add more milk. For the confectioners’ sugar, you’ll need Swerve confectioners’ sugar replacement. Hi, Maureen, Please read the post to the end! I have a whole section on “Ingredients and Substitutions” and it explains all of my recommendations for all the other allergens. Enjoy! Oh my gosh, Mimk, I often freeze baked goods! You’re in for a treat. The refrigerator tends to alter moisture and flavor content (and not for the better), but placing well-wrapped and sealed baked goods in the freezer kind of arrests time! They freeze great as baked and even filled. I made these over the weekend. My chocoholic kid didn’t like ’em, but my chocohater kid actually said “UMMMM!” on the very first bite. Have to tell ya, it was thumbs up on the naked whoop, without the cream cheese inside. So, guess I now have a carrot cookie recipe! Btw, you scared the bejezus out of me – the email subject line “Last Week on the Shoestring” made me think “OMG, she’s quitting??? ?” Whew, thank goodness I was wrong. I own your first book, your new book is preordered, and I can’t wait for the next one. And I giggled at “naked whoop,” since I’m not very mature. Thank you for your support of the books! please open a small gluten free bakery in my town! Rockwall Texas…..PLEASE! These sound heavenly! And I agree that the whole point of carrot cake is the marriage of cream cheese with the subtle spices and the sweetness of cooked carrots in the cake. This maybe my new favorite. Oh indeed, Rebecca. Big time fave of mine. 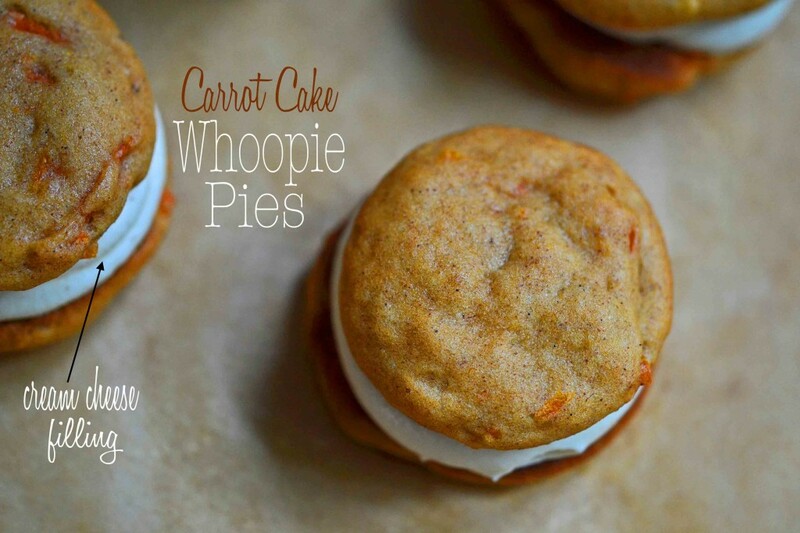 What a great twist on the classic whoopie pie! 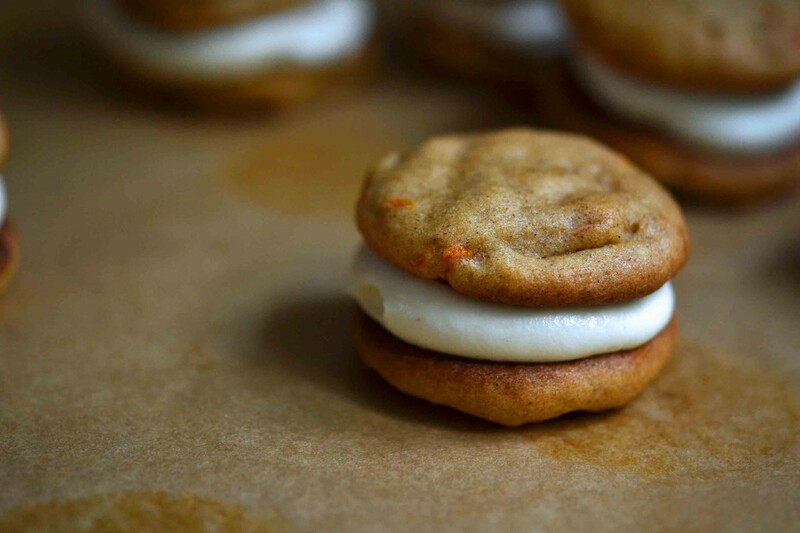 I bet a pumpkin flavored cookie would taste amazing as well! With maybe a chocolate cream cheese filling. Hmmm, could this recipe be used to make plain ol’ carrot cake, too? Or do you already have a recipe for the cake that I missed? Hi, cpw, No, this recipe can’t be used to make regular carrot cake. It has a completely different consistency. I have a recipe for gluten-free carrot cupcakes that I posted years ago, and a recipe for Gluten-Free Pumpking Carrot Cupcakes from about a year ago. Oh, no doubt, Gina. Who can complain, anyway, with cream cheese filling? Well, I guess even best friends have to disagree on something . . . no carrot cake for me! I have tried it so many times, because it seems like something I should love, but I just don’t. I know we can still be besties, though, ’cause you don’t judge. Frankly, I am always a little relieved when a recipe shows up on the blog that I am not going to make, since I am so busy making bread and breakfast cookies and muffins to keep my kids in lunch and breakfast food that I don’t really have time for something new! Hope you have a beautiful fall day today! Or maybe a carrot cake with raisins. That’s what often ruins it for me! I tell you, Nicole, I have eaten every recipe known to man, from bakeries to my grandmother’s — coconut, raisins, nuts, or none of the above. I think maybe it is a defective gene! Resting up as much as possible for the new book, and pretty darned excited about the breads coming in book 3! You are officially carrot-cake-broken. I give up!